Figure 1. Yellow-billed cuckoo (© David Speiser, www.lilibirds.com). Yellow-billed cuckoos feature unmarked grayish brown upper plumage, white underparts, large reddish brown wing patches, a long brown tail marked with bold white spots, and a mostly yellow bill (Figure 1). Vocalizations include a distinctive ka, ka, ka, ka, ka, kow, kow, kow call. The species is migratory and once bred across much of the U.S. and parts of Canada, Mexico, and the Caribbean. Breeding range in the U.S. is now largely restricted to the eastern and central regions (Hughes 1999). Wintering occurs across much of the northern two-thirds of South America (Hughes 1999, Sechrist et al. 2012). 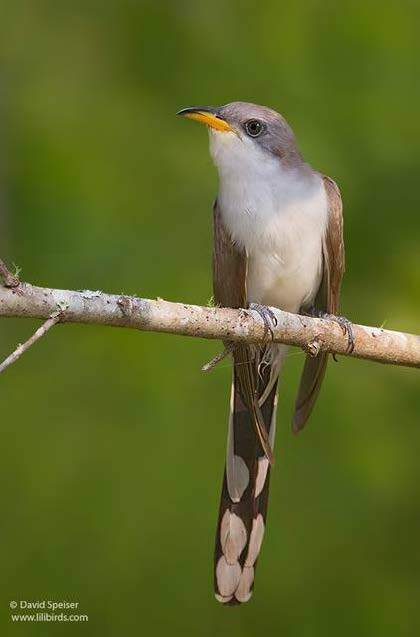 Two subspecies are often recognized, with the western yellow-billed cuckoo (C. a. occidentalis) present in western North America (Figure 2; Hughes 1999). In the breeding range, yellow-billed cuckoos prefer open lowland deciduous woodlands with clearings and shrubby vegetation, especially those near rivers and streams (Hughes 1999). In western North America, there is a strong preference for large continuous riparian zones with cottonwoods and willows. Diet consists mainly of large insects such as caterpillars, grasshoppers, katydids, beetles, and crickets; small frogs and lizards, bird eggs, and nestling birds are also occasionally eaten. In western North American, yellow-billed cuckoos begin arriving from migration in mid- to late May, making them one of the last migrants to return (Bent 1940, Hughes 1999, Tweit 2005). Most nesting occurs between June and early August, but can extend from late May until late September (Brown 1923, Jewett et al. 1953, Hughes 1999). Unlike many species of cuckoos, yellow-billed cuckoos often build their own nests and care for their own young. Nests are usually loose platforms of twigs lined with leaves or finer materials and, in the West, are often placed in willows, cottonwoods, and shrubs (Brown 1923, Gaines and Laymon 1984). Clutch size ranges from 1-5 eggs, but is usually 2-3 (Hughes 1999). The entire period from egg laying to fledgling is one of the shortest among all bird species and lasts only 17- 18 days, with incubation extending 9-11 days and nestlings fledging at 7-9 days of age (Hughes 1999). Young can fly at three weeks of age. Two clutches may be laid in years of good food supply. Yellow- billed cuckoos also occasionally lay their eggs in the nests of other yellow-billed cuckoos as well as other species, such as American robins, gray catbirds, and wood thrushes. This behavior is known as brood parasitism. Population status. 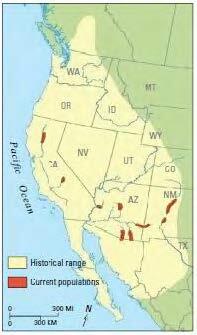 The western yellow-billed cuckoo has experienced a major decline in its breeding range since the 1800s and is now extirpated throughout most of its historical range except for small and widely dispersed nesting populations in California, Arizona, and New Mexico (Figure 2) and a few scattered nesting pairs in Idaho, Utah, Colorado, and Nevada (Reynolds and Hinckley 2005, Johnson 2009). Breeding no longer occurs in Washington, Oregon, and British Columbia (Campbell et al. 1990, Marshall 2003, Tweit 2005). In Washington, J. K. Townsend considered yellow-billed cuckoos abundant along the lower Columbia River at present-day Vancouver in the 1830s (Jobanek and Marshall 1992). Subsequent observations suggest they were an uncommon nester in the Puget Trough in the early 20th century, but were rare in the state by the late 1930s or 1940s (Burleigh 1929, Jewell et al. 1953, Smith et al. 1997, Tweit 2005). Breeding had apparently ended by 1934 (Roberson 1980). No nesting records exist for eastern Washington, despite the presence of apparently suitable riparian corridors, occasional past sightings during the summer, and documented breeding in eastern Oregon and southern Idaho. Reports of individual cuckoos have been very rare in recent decades, with only about 12 records made between 1950 and 2000 (four in western Washington, eight in eastern Washington; Tweit 2005; U.S. Fish and Wildlife Service, unpublished data). Three reports are known since 2000, these being near Lind (Adams Co.) in 2001, near Eureka (Walla Walla Co.) in June 2007, and from Little Pend Oreille National Wildlife Refuge (Stevens Co.) in June 2012 (WOSNews and eBird reports; U.S. Fish and Wildlife Service, unpublished data). It is unknown if all of these records involve the western subspecies (Roberson 1980, Tweit 2005). Threats. Habitat loss and pesticide use are thought to be two of the main causes for the precipitous decline of western yellow-billed cuckoos (Gaines and Laymon 1984, Laymon and Halterman 1987, Iten et al. 2001, Wiggins 2005). Agriculture, grazing, reservoir construction, flood control, urbanization, and other factors across the West have caused the large-scale loss and degradation of lowland riparian forest, which is the cuckoo’s primary habitat. In California, cuckoos prefer intact riparian woodlands of 10-15 ha or more. Exposure to pesticides in both the breeding and wintering ranges is another potential threat that may be causing reduced availability of insect prey and eggshell thinning. Other unknown factors may also threaten the population. Inventory and conservation. Almost all recent records of yellow-billed cuckoos in Washington have come through the birdwatching community. No management activities specific to this species are currently conducted due to its scarcity in the state, although broader efforts to protect and restore riparian forests would likely be beneficial. In 2012, the U.S. Fish and Wildlife Service began working on a proposed rule to list the western distinct population segment of cuckoos and expects to publish this in 2013 (USFWS 2012). Partners and cooperators: U.S. Fish and Wildlife Service. Bent, A. C. 1940. Life histories of North American cuckoos, goatsuckers, hummingbirds, and their allies. U.S. National Museum Bulletin No. 167, Washington, D.C.
Brown, D. E. 1923. Notes on the nesting of the California cuckoo (Coccyzus americanus occidentalis) in Washington. Murrelet 4:17. Burleigh, T. D. 1929. Notes on the bird life of northwestern Washington. Auk 46:502-519. Campbell, R. W., N. K. Dawe, I. McTaggart-Cowan, J. M. Cooper, G. W. Kaiser, and M. C. E. McNall. 1990. The birds of British Columbia. Volume 2, nonpasserines: diurnal birds of prey through woodpeckers. UBC Press, Vancouver, British Columbia. Gaines, D. and S. A. Laymon. 1984. Decline, status and preservation of the yellow-billed cuckoo in California. Hughes, J. M. 1999. Yellow-billed cuckoo (Coccyzus americanus). In A. Poole and F. Gill, editors. The birds of North America, No. 418. The Birds of North America, Inc., Philadelphia, Pennsylvania. Iten, C., T. A. O’Neil, K. A. Bettinger, and D. H. Johnson. 2001. Extirpated species of Oregon and Washington. Pages 452-473 in D. H. Johnson and T. A. O’Neil, managing directors. Wildlife-habitat relationships in Oregon and Washington. Oregon State University Press, Corvallis, Oregon. Jewett, S. G., W. P. Taylor, W. T. Shaw, and J. W. Aldrich. 1953. Birds of Washington state. University of Washington Press, Seattle, Washington. Jobanek, G. A. and D. B. Marshall. 1992. John K. Townsend’s 1836 report of the birds of the lower Columbia River region, Oregon and Washington. Northwestern Naturalist 73:1-14. Johnson, M. J. 2009. Understanding the habitat needs of the declining western yellow-billed cuckoo. U.S. Geological Survey Fact Sheet 2009-3091. Laymon, S. A. and M. D. Halterman. 1987. Can the western subspecies of the yellow-billed cuckoo be saved from extinction? Western Birds 18:19-25. Marshall, D. B. 2003. Yellow-billed cuckoo Coccyzus americanus. Pages 305-307 in D. B. Marshall, M. G. Hunter, and A. L. Contreras, editors. Birds of Oregon: a general reference. Oregon State University Press, Corvallis, Oregon. Reynolds, T. D. and C. I. Hinckley. 2005. A survey for yellow-billed cuckoo in recorded historic and other locations in Idaho. TREC, Inc., Rigby, Idaho. Roberson, D. 1980. Rare Birds of the West Coast of North America. Woodcock Publications, Pacific Grove, California. Sechrist, J. D., E. B. Paxton, D. D. Ahlers, and R. H. Doster, and V. M. Ryan. 2012. One year of migration data for a western yellow-billed cuckoo. Western Birds 43:2-11. Smith, M. R., P. W. Mattocks Jr., and K. M. Cassidy. 1997. Breeding birds of Washington state: location data and predicted distribution. In K. M. Cassidy, C. E. Grue, M. R. Smith, and K. M. Dvornich, editors. Washington state gap analysis - final report. Volume 4. Seattle Audubon Society Publications in Zoology No. 1, Seattle, Washington. Tweit, B. 2005. Yellow-billed cuckoo Coccyzus americanus. Page 210 in T. R. Wahl, B. Tweit, and S. G. Mlodinow, editors. Birds of Washington: status and distribution. Oregon State University Press, Corvallis, Oregon. USFWS (U.S. Fish and Wildlife Service). 2012. Endangered and threatened wildlife and plants; review of native species that are candidates for listing as endangered or threatened; annual notice of findings on resubmitted petitions; annual description of progress on listing actions. Federal Register 77(225):69994-70060. Wiggins, D. A. 2005. Yellow-billed cuckoo (Coccyzus americanus): a technical conservation assessment. USDA Forest Service, Golden, Colorado.